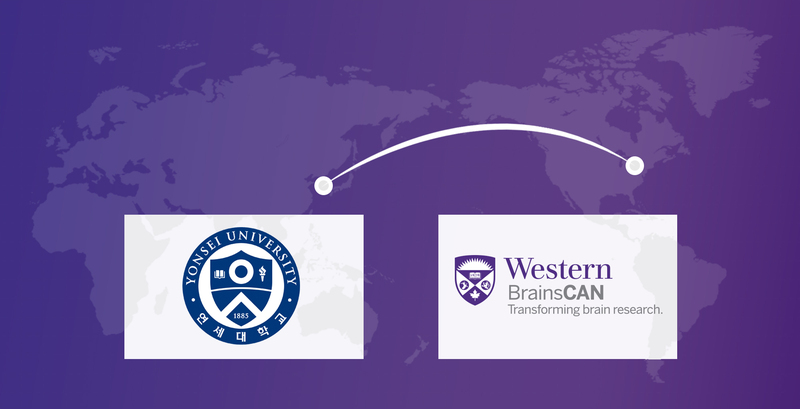 BrainsCAN, Western University’s neuroscience research initiative, is building international collaborations with a new memorandum of understanding (MOU) with Yonsei University in Seoul, South Korea. In the recently signed MOU, BrainsCAN and Yonsei researchers will work together to find effective solutions for maintaining a healthy brain. BrainsCAN Co-Scientific Director, Dr. Lisa Saksida and Yonsei Dean of Medicine, Dr. Yangsoo Jang sign the BrainsCAN-Yonsei memorandum of understanding (MOU) at Yonsei University in Seoul, South Korea. In addition to training opportunities, researchers from the two institutions will work together on joint collaborative research projects. With this MOU, principal investigators, postdoctoral fellows and graduate students from Western and Yonsei will benefit from increased access to scientific and technological information, along with institutional resources. The BrainsCAN and Yonsei partnership officially begins January 2019. Opportunities for BrainsCAN-aligned researchers to connect with Yonsei will be posted on BrainsCAN’s website when available. For further information, please contact brainscan@uwo.ca.